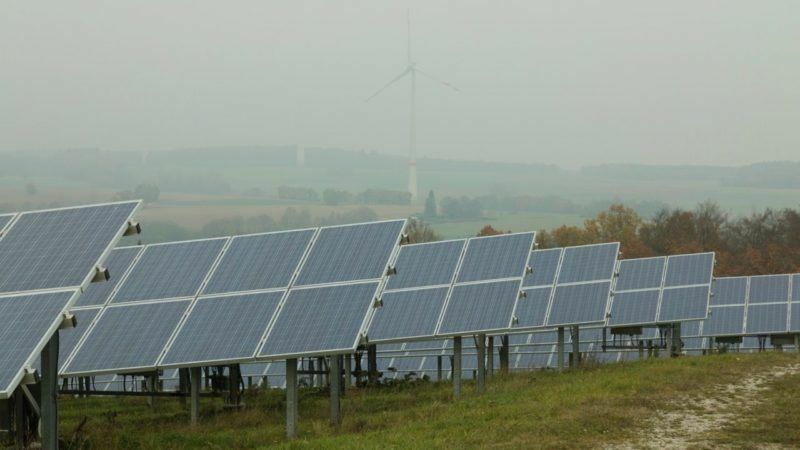 Local communities are at the forefront of the clean energy transition in Germany, with some villages relying 100% on renewables. EURACTIV Slovakia spoke to mayors there. Neuerkirch and Külz are two small villages in Western Germany – of 300 and 500 souls respectively. And yet, they feel a part of something bigger that goes even beyond the country’s energy transition, the ‘Energiewende’. “We are happy that we don’t have to be supplied by Vladimir Putin and Saudi Arabia,” the mayor of Neuerkirch, Volker Wichter, told journalists during a visit organised by the German government’s European Climate Initiative. Neuerkirch and Külz abandoned their old fossil fuel heating system for a 100% renewable heating system – a biomass plant supplies 75% of the energy and a solar thermal plant provides for the rest. Only a few homes are not connected to the central system. The two villages lie in the German federal state of Rhineland-Palatinate, which brands itself as a “pioneer” of the ‘Energiewende’. Apart from the biomass and solar plants, the region is also known for its wind farm. Local communities receive hundreds of thousands of euros annually for leasing their land to the turbines. The operators can afford to pay thanks to the feed-in tariff or other forms of national subsidy. Toni Christ is the former mayor of Mastershausen, a small town of 1,000 inhabitants in the rural area of Rhineland-Palatinate. A few years ago, the municipality invested €64 million in renewable power capacity. Investors built 14 wind turbines for €50 million and a couple of solar power plants for €11 million. The new grid connections cost them €3 million. Based on 25-year contracts, the town now cashes in at least €260,000 per year for the land lease. The revenue can climb up to €350,000 depending on how strong the sun shines or the wind blows. Christ had to battle hard to convince his people that the wind turbines would not impact the environment. He deliberated the issue with inhabitants before the investment decisions were made. When people voiced concerns about possible harm to the bird population or about the noise generated by the turbines, he brought in experts who reassured them. Mastershausen used the revenue to fund the construction of a fast Internet network, roads, playgrounds and a library. The town hall gives out money to families with newborns. And it funds, of course, the local energy transition via subsidies for house insulation and public transport. “We even have English and Dutch families moving in,” Christ rejoices, adding that thanks to the Internet and improved transport, employees can work from home. More importantly, the newly empowered local communities embody the kind of “grass-roots democracy” that is enabled by renewable energies, both men argue. To be fair, the energy transition would not have been possible without the feed-in tariffs that operators receive when selling renewable power to the regional grid. But on the other hand, the wind turbines produce much more energy than the village needs. With backup sources, it could be entirely self-sufficient. Some German towns even own their renewable power plants. Wolfhagen in the neighbouring federal state of Hesse has a 10MW photovoltaic power plant, the largest in the Bundesland, and a 12MW wind park. There is also hydropower. Wolfhagen has been 100% powered by renewable since 2014. The town is connected to the regional grid, which supplies most of the 13,500 inhabitants, and backs up the weather-dependent renewables. On an annual basis, the town is a net exporter of electricity. Return on investment is not a concern for Huntzinger. The money that went into the wind turbines will be recovered in 10 years thanks to the electricity trader that was hired by the utility, he says. According to Benjamin Böhme from Windtest Grevenbroich, a development and service company, one megawatt of onshore wind energy requires an investment of €1.5 million. It takes two to five years to build a turbine and go through the whole regulatory process. Windtest has a testing facility for a new generation of wind turbines in the federal state of North-Rhine-Westphalia, which is also host to Germany’s largest and dirtiest lignite power plant, Neurath. One of these turbines supplies electricity to the Bundesland on the southern border with Rheinland-Palatinate. Thomas Griese, the State Secretary at Rhineland-Palatinate’s environment ministry, admits that his state continues to depend on electricity imports for 30% of its consumption. But 47% of electricity produced in Rheinland-Palatinate is renewable. Griese hopes that in 2030 the green dream of 100% renewable electricity will come true on the state level. At least this is the plan. According to Griese, there are known solutions to what he calls the “dark doldrums” when the wind is not blowing and the sun not shining: power-to-gas, demand-side management, pumped storage, batteries, expansion of the grid over weather zones and offshore wind parks – all these can act as backup power, he says. In fact, Griese seems to be more concerned by a different issue – nuclear power. “Dismantling a nuclear power plant is very expensive. It will last decades. Fortunately, we have only one,” Griese says. This article is part of EURACTIV Slovakia’s coverage of energy innovations ahead of the Central European Energy Conference – SET Plan 2017 taking place in November and December in Bratislava. 1. Biomass could not be scaled up; you’d probably need ten German landmasses to give the same available biomass production areas to the entire population, particularly large urban areas such as Berlin. It is like village spowered by waste incidneration plants – a small number of people ‘extractors’ who rely on a much larger group of ‘contributors’. 2. Unless everyone in the village uses electric transport all the time, then they aren’t 100% renewable at all. 3. As the article points out, it is only financially possible because of the heavy subsidisation made for reneweable energy, in the form of profitable tariffs the villages are able to sell.Again, this is not possible to scale up as there is not “someone else” the subsidise Germany as a whole. In short, small villages with tiny populations are an entirely different prospect to cities, which is where the vast majority of people live. The “Energiewinde” is a con. Germany abandoned nuclear as a response to public hysteria and nothing else, and the main result to was have to spend hundreds of billions on retooling it’s energy grid, to burn lots more filthy lignite and to hypocritically import a lot more electricity at times of need from nuclear France next door. The article doesn’t claim that biomass is for everyone, it illustrates the need for a variety of technologies. But the picture looks like PV not evacuated tubes – solar thermal. More info please.